BURGER KING® restaurants are introducing a hot new product, Spicy Chicken Nuggets. BURGER KING® restaurants are introducing a hot new product, Spicy Chicken Nuggets. Available for a limited time, Spicy Chicken Nuggets are made with a spicy home-style breading that gives the product a fiery kick. The crispy 10-piece meal packs serious heat and will leave our guests craving more. 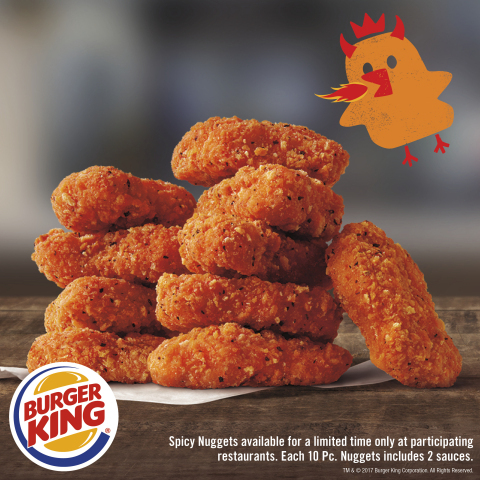 "We know there is an appetite for Spicy Chicken Nuggets, our competitors have launched similar products in the past, and fans will be excited for this delicious product at BURGER KING® restaurants," said Alex Macedo, President, North America, for the BURGER KING® brand. "Our $1.49 chicken nuggets have performed very well and we want to offer that same great value with our Spicy Nuggets." To celebrate the launch, guests named Wendy will receive one free 10 pc. order of Spicy Chicken Nuggets after noon on October 13 th with a valid ID at limited restaurants in Los Angeles, California, Miami, Florida and New York, New York*. Spicy Chicken Nuggets are available now at participating BURGER KING® restaurants nationwide for a limited time only, while supplies last. They have a recommended unit price of $1.49 with 10 pieces per order. Original Chicken Nuggets will remain a permanent menu item during and after the Spicy Chicken Nuggets limited time offer period. OFFER DETAILS: Offer valid for one 10 pc. Spicy Chicken Nuggets, no substitutions. One per guest. Not valid with any other coupon, discount or offer. Not valid on drive-thru. Must present valid government-issued identification listing guest's first name as "Wendy." This offer redeemable only at limited restaurants in Miami, Florida; Los Angeles, California, and New York, New York. Participation may vary by restaurant. Void where prohibited. No cash value. Not valid on Burger King® App mobile orders. TM & © 2017 Burger King Corporation. All rights reserved. Valid 12PM-close on 10/13/17.